Star Wars fans, get your phones ready because you’re about to get a new background/lockscreen photo. The official poster for ‘Rogue One: A Star Wars Story’ was unveiled this morning and it’s looking appropriately summery. 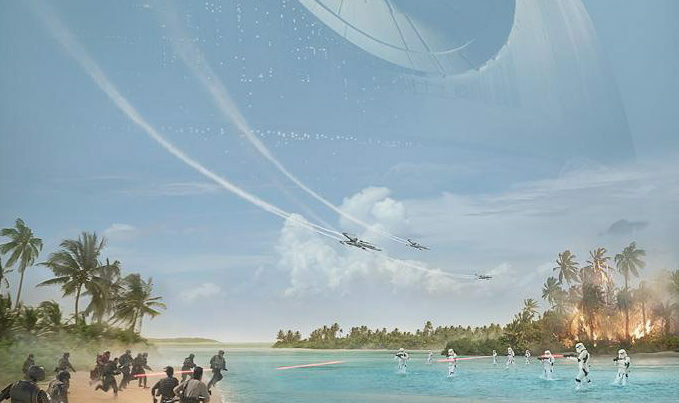 Minus, of course, all the laser action, fire in the palm trees, and the Death Star looming over the whole scenery. But hot damn, this is another fine poster from the Star Wars universe. ‘Rogue One’ is the saga’s first spinoff title from the original trilogies, which is set to take place before the events of ‘A New Hope.’ Cast includes Felicity Jones, Diego Luna, Donnie Yen, Forest Whitaker, and more. Alongside the poster, there’s also a behind-the-scenes look at the upcoming flick for the holidays. Get excited!